This week has been a very busy and exciting week for Reception. After much anticipation we finally went to Bockett’s Farm. There was a really buzz in the air as the children embarked on the minibuses and the excitement definitely grew on the journey with lots of jolly singing and discussions. We met our group leader Lauren for a tractor ride which was rather bumpy but did not dampen the spirts. Next we were off to see alpacas, llamas and the donkey who welcomed us with a very loud bray. A quick run to the bottom of the field took us to the big animal shed to see the little lambs, piglets, calves and to stroke the horse. We then had a chance to see a goat being milked and to stroke a few of the smaller animals. There was great delight when it came to lunchtime and we opened our packed lunches, thank you Karen! The pig races afterwards proved very popular and quite a few of the children deemed this the highlight of the day; for others the play area was definitely a hit. 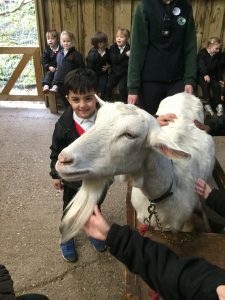 All in all it was a very successful trip for Reception! We also continued our work in Maths on days of the week and clocks, reading o’clock and half past. RWI resumed as normal with everyone working hard and making good progress. We even managed to squeeze in making a Mother’s Day surprise so keep an eye out for those at our Mother’s Day service next Friday morning. Thank you for all the recycling, the children enjoyed the farm making and we have plenty left so won’t need any more for the time being.